Focus! Think Fast! Act Faster! Then Relax! 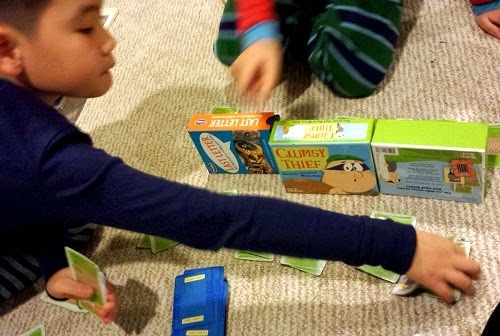 Use Working Memory & Speed Reading to Win This Game. DOES: Why "be tested," instead, let them test themselves. 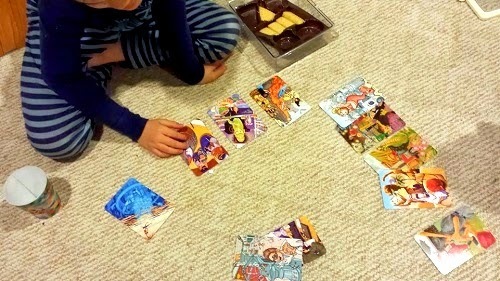 These games arouse the hunt and gather instinct in our young humans. GIVEAWAY PRIZE:One Winner Wins BOTH Games!!! One of the Toys Are Tools' tester moms is so stressed because of the state tests. Recently, she told me about a briefing session given by the school staff about the test. They dutifully explained the ins and outs of the test to the parents and gave some test-taking tips to share with their children. The teacher even told the parents that to check over math answers, the best way was to do the problem over again in a totally different method. That was shocking. The kids are so young! I would have no patience for that. Still, the thing that bugged me the most was this: They told her that kids cannot study for the state test. It is based upon whatever has been learned to date. 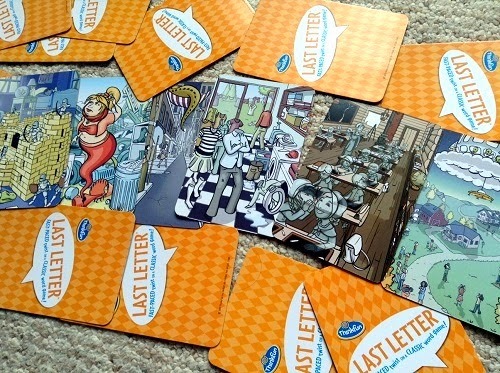 This game is perfect for those who "run-read." They read only the first half of the word and run to the next word. The pictures will motivate them to finish out those last sounds. Really? Kids can't study for those tests? I suppose that this statement is true to an extent but we must recognize that children can learn effective test-taking strategies that can help them score higher points. HOWEVER, TO BE CLEAR, the purpose of this story today is not just about scoring higher points. Rather, it is about alleviating our children's anxiety and I would guess that this element alone would probably lead to higher points anyway, not just in the test but in personal satisfaction too. So many kids worry about it. If they are being told to do over math problems via different methods should they have time left over to check over their work then I can't imagine how any kid would not feel stressed by that. If a high school kid were to do that, fine, okay... but an elementary school kid? The first year that Tester #1 took a state test, I framed it as "It's your civic duty. You have to show what you know because your government wants to know what kids have learned in school." I said this only to alleviate any anxiety he might experience. This is a great example of how play builds confidence. I do feel that change is coming but until it does, we need to help our kids not be so afraid. If they or you think they'll feel badly if they do poorly then I say, they either shake the feeling off or decide to play the game. Yup, that's right. Treat it like a game. Why make it less serious, you may ask? Who said anything about making it less serious? Kids would sooner blow off a test than blow off a game! That said, we should teach our kids how to be good hunter gatherers. Teach them how to be opportunistic by thinking fast and collecting as many points in their bag before time is up. Tell them to remember that rest and relaxation and pizza and Netflix await them after they come back from their hunt. 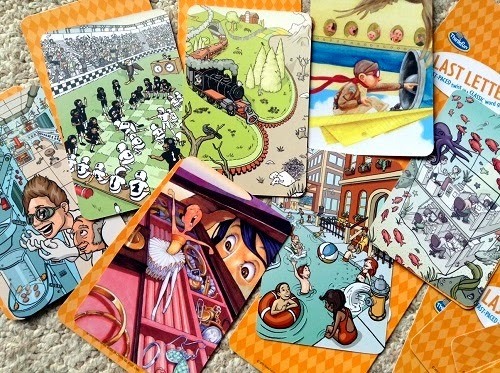 Five different illustrators designed these cards. That keeps kids ALERT. Quick find an "S" word. 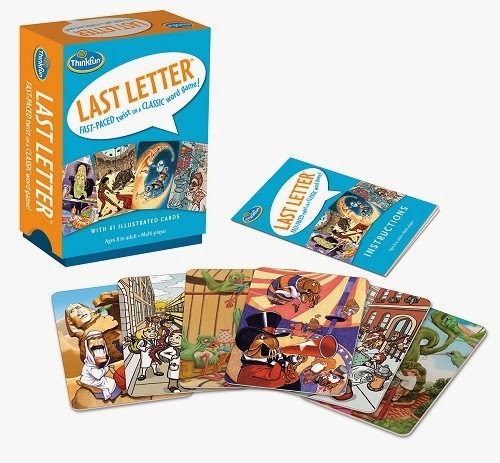 When I was young, I loved playing Last Letter Geography-- I would never run out of A-words! I think it was easy for me because I would look at the map (in my mind) and swipe and zoom as if I had an iPad. Nowadays the act of searching is done for us often automatically. 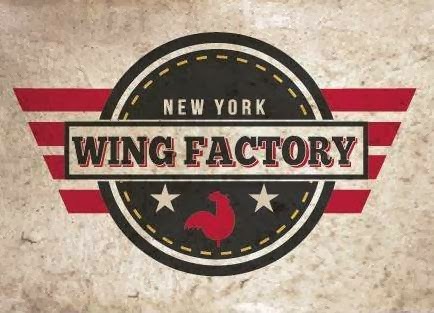 You put in the name of a restaurant and Google not only completes the word for you but then offers you a map with the destination already pinpointed. I'm not saying this is bad but we must still teach our kids to find what we need, even if we don't quite know what it looks like exactly. 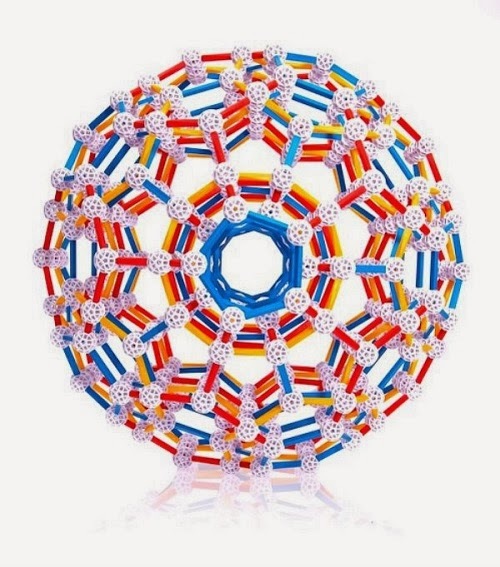 To be sure, I highly doubt that we would see anything on a state test that looked like the ThinkFun's Last Letter game. However, what we are training our kids to do is something similar. It is the act of finding what you need. The act of trying out different cases and choosing the best one ..... hmmm... sounds like multiple choice to me. Even with something like reading comprehension (my most HATED subject in school- pure torture it was), we can show our kids that they have what it takes to be good hunters. 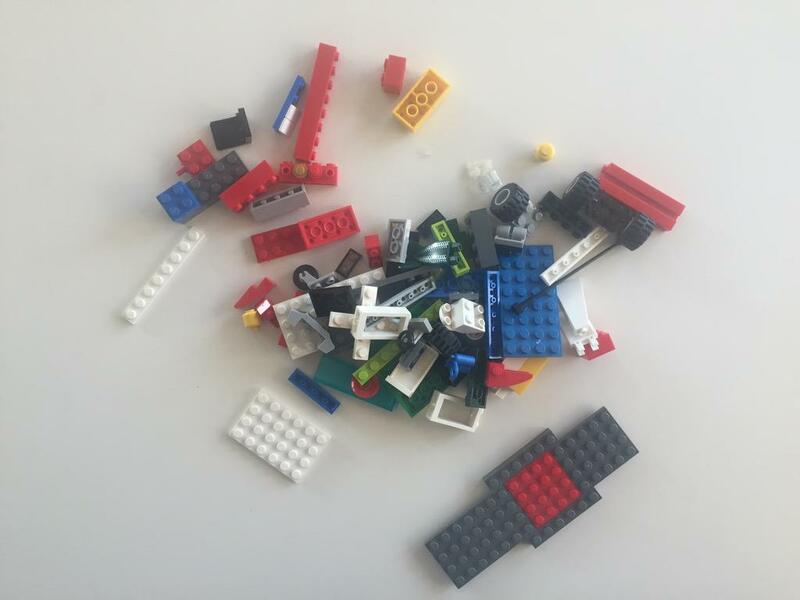 I love that these were created by five different artists because you can ask your child to sort them out into five piles based on who they think might have created it. It's okay if they are wrong (We don't know anyway) but the point is to keep them looking and making observations, the first step to being an Opportunist. Me: "Looking for a word that starts with 'E'? Take a quick scan, be fast!" Him: Yeah, I got nothing. ARGH. Me: Now let's try again, but this time, let's not look not at the obvious things like we did just now, let's look at new things, smaller things, things that caught our eye but we didn't fully chew on it yet... ah... "emerald" you say? The dragon is emerald green? I'll accept that. That's pretty cool. We play open face when we play with #2 who is still sharpening those opportunistic skills. My son tried to eke out the word "emerald" once before (see video) but he didn't have the confidence to complete that decision. We need confidence to complete tests. We need to practice the self-talk in our head and learn to trust our own observations and conclusions. That's the practice that we can all use with test-taking. It's a skill that no one tells you about but it's very important. Second-guessing is not the same thing as thinking things through. Second-guessing makes you lose points. This is why I love Last Letter. It lets children search for opportunities and become more confident in their decisions. 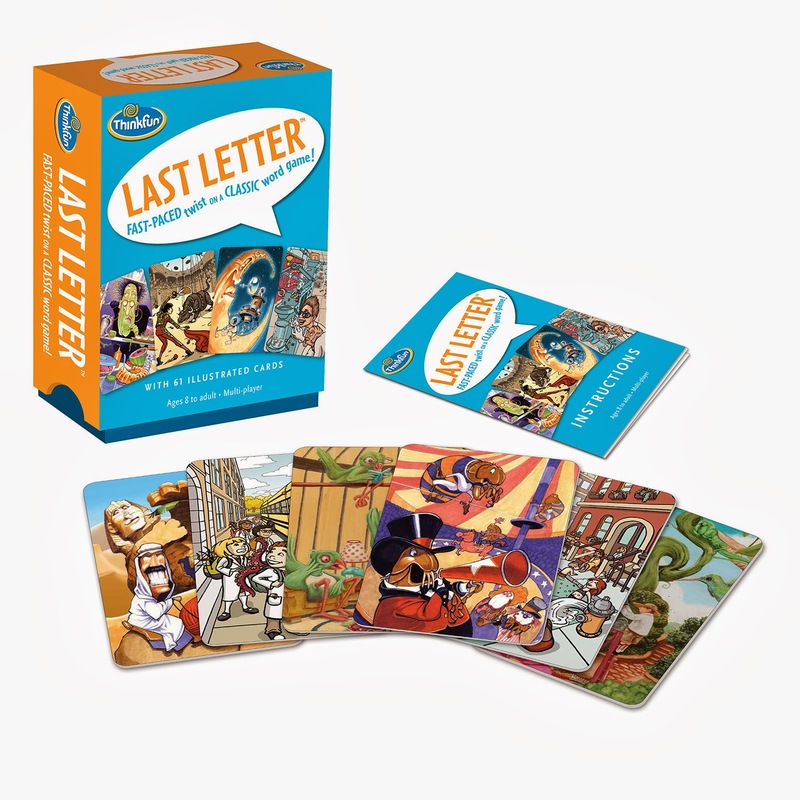 Speaking of opportunities, this game was invented by brothers Dave and Joe Herbert who had also invented one of my ultimate ThinkFun faves WordARound! The brothers were famous even before this game because of their production of a Super Bowl ad that won them $1 million in prize money. Watch the ad below, you will certainly recognize it. Yup, this is them. They make games too. Good ones. On each end is a player and his cards open faced for you to see. 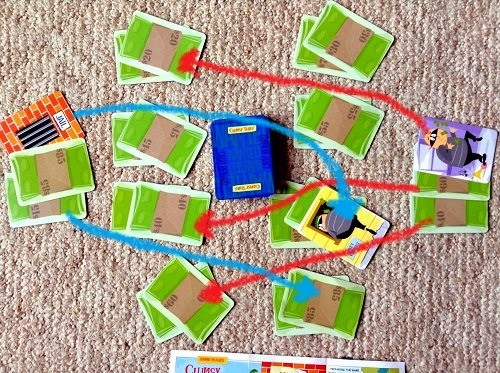 The arrow shows how you can steal piles of money. 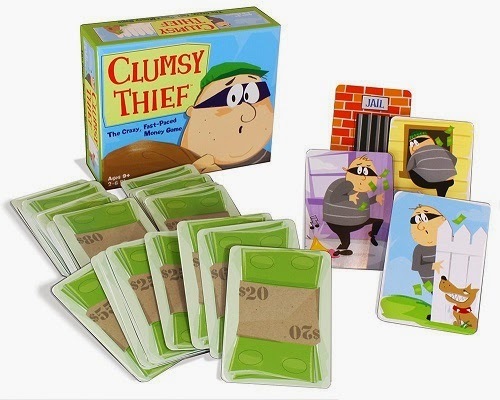 Just add one card that adds up to $100 or use a thief. You probably don't want to play open face with this though. I like a game where it is good to be bad. It's like running an entire race backwards. It's good to step outside your regular self sometimes, isn't it? 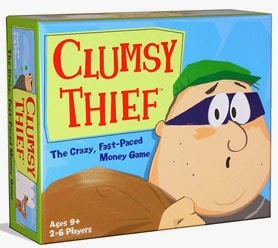 Games allow us to do that (with permission) especially Clumsy Thief. As long as the players are content with getting things stolen from them, everyone is bound to have fun. 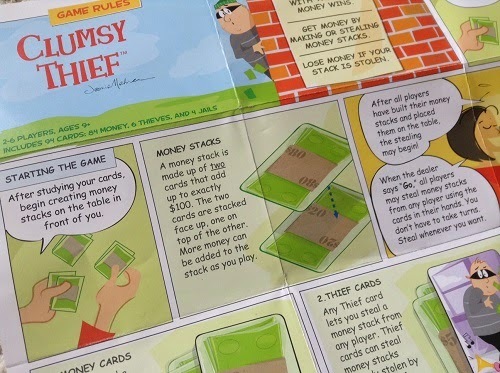 Moreover, what is very fun about Clumsy Thief is the how much of your body goes into this game because once you spot a stack to steal, you must do it fast! (Someone else might steal it too) I think that is important because test-taking is tough on the body. And while children are not encouraged to leap over their desks to fill in a circle with their No. 2 pencil, I think that the practice they have had in thinking fast and acting faster and thus, tuning up overall body awareness and control could possibly help them as they keep trying to complete an action to get points. 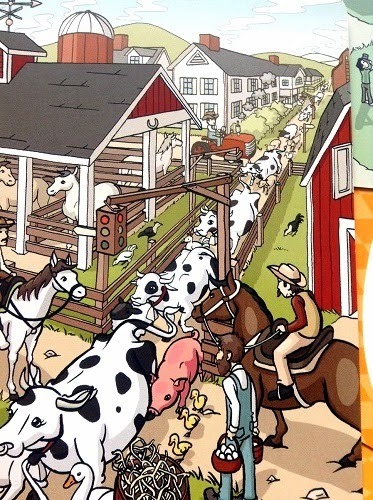 I love cartoon directions! I totally dislike reading detailed written directions. Who wants to read directions to play? That even sounds weird. They will pick up a card and then it's mayhem. Players start stealing and it gets crazy. Be A Calculator And Just Compute! I think that the straight computation problems, you are going to do better if you think like a calculator. I probably don't make any sense but consider this interesting story told to me by Jeanie Mehran, the inventor of Clumsy Thief. Jeanie's son David, as she described him, is a clever boy who loves stories, art, ... basically anything involving imagination. But with math, it just wasn't clicking for him and he struggled with basic skills (addition, subtraction, multiplying, and dividing). 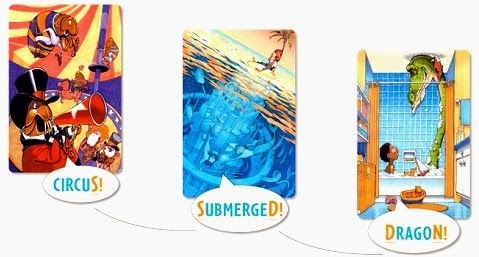 Reward your quick thinking by stealing those cards. It's multi-sensory learning. It's also an affirmation of a decision you've made. That is important in test-taking. You need to feel sure about yourself. Jeanie felt that the only way to help David was to increase fluency in those basic skills. But how? Basically, she thought he just had to practice... a lot. But Jeanie knew that the answer didn't lie in buying workbook after workbook... no... it would have to come in another format like a game.. Why a game? She thought about her favorite game as a kid "Battleship." She had to really get into the grid system (um.. that would be.. MATH) to sink those bloody ships! Jeanie searched for a good game for her son but came up with nothing. Eventually, she decided to make up something herself- Clumsy Thief. David loved it and so did his classmates and teachers and now you can count my family as the Thief's newest fans. And it is because this game appeals to something very instinctive in humans... we love to seek, find, and collect. 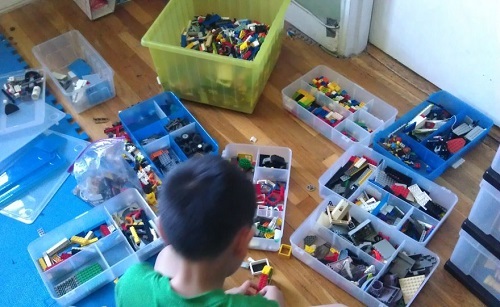 (marbles, coins, stamps, LEGOS.....) But when you have limited time to "collect", we need not think about our own feelings or even how much time we have... no, we just have to be accurate and we have to be fast. There is NO ROOM for anxiety- remember, they had to be a calculator for a while. I think that can be helpful when it's only a test. After the test, they can go home and play loud music and jump on your bed. They earned it. And what about David? At his school for gifted kids, this sixth grader is now working on "recursive and explicit algebraic sequencing." (Yeah, I don't know what that means either) Three years ago, as a third grader, he was having trouble adding 40 +61 and now he's doing THAT? How can this be? What happened? 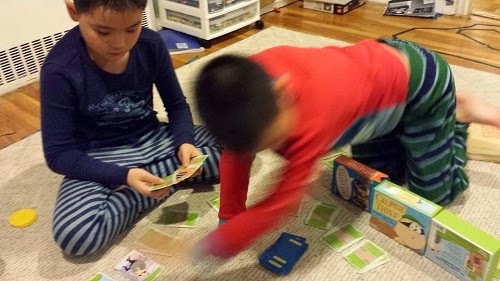 While no one will say that a game will fix all of life's problems, don't tell that to David who recently told his mom that it was all the activities, games and books she provided for him that got him comfortable with math. What a case for you to keep reading Toys Are Tools! Thanks David! But seriously, David also has to give himself some credit too because he was being an excellent opportunist. He would never have gotten anywhere if he didn't decide to first throw his hat in and play the game. I am quite certain that he knew he was playing a math game but I guess he decided to not care about that. He just played. With that attitude, you will always come out a winner no matter how many points you score. 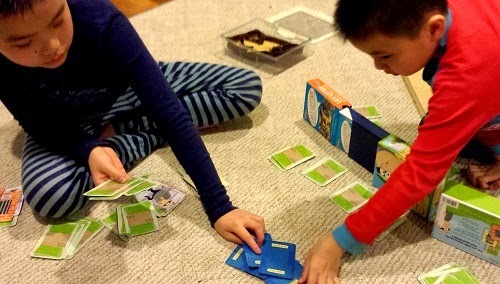 I first saw Robot Turtles on KickStarter and it looked exactly like the type of game my kids would love. We plan to pick it up when it comes out. I tell my kids to be confident and to do their best. I LOVE the idea of Robot Turtles! I would like both of my kids to learn programming when they are able, and this is a great way to help kick off the interest. I've bookmarked their site to check it out more later!